So many of the gracious homes I have the pleasure of working on, are custom-designed specifically for the client. From size to style, each detail is a collaborative effort that makes for a wonderfully unique outcome. With these customized spaces comes the need for custom furnishings…this is where the fun starts! 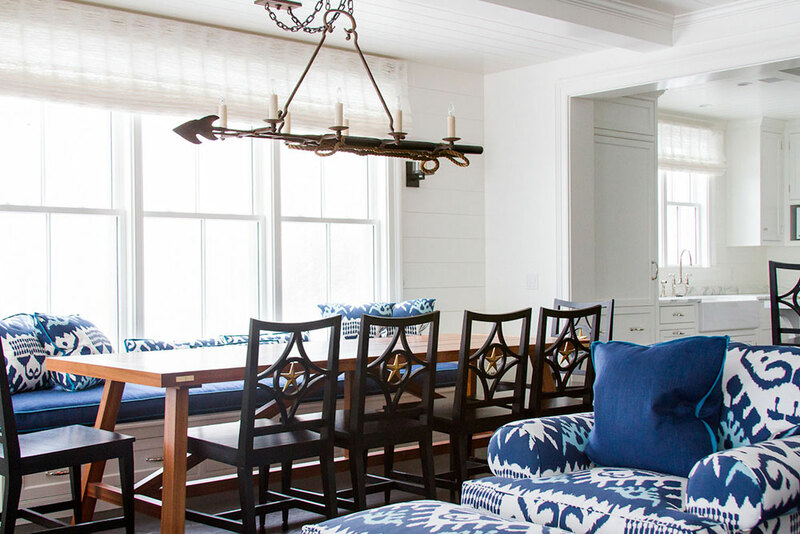 Recently, a young family hired me to design their Nantucket summer home. This project allowed for a number of great collaborations and inventive design solutions. One of my favorites was the chandelier that hangs over their breakfast table. 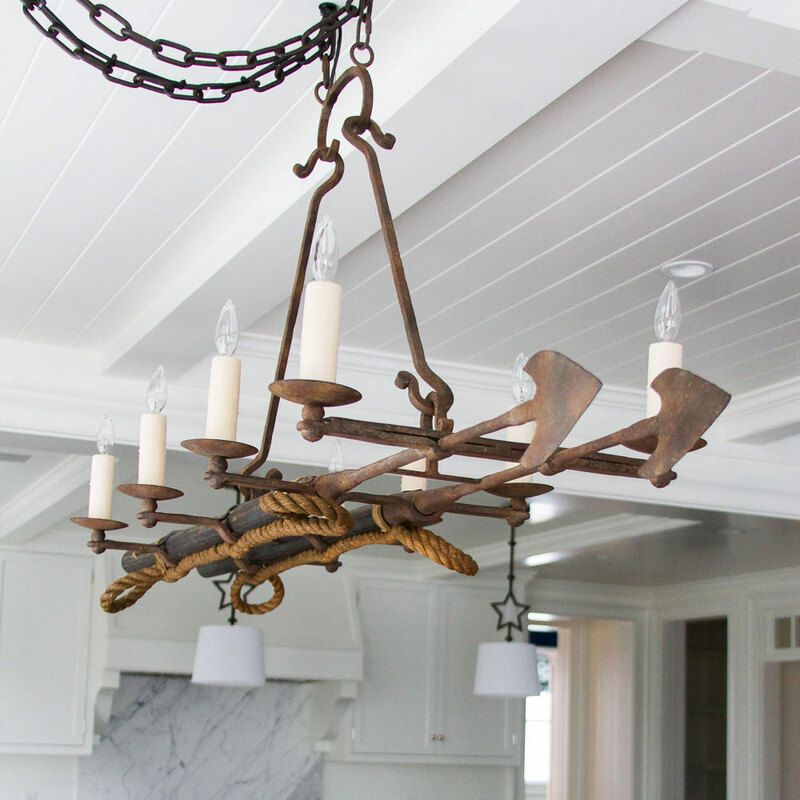 With what started as a wish of the clients, ended with an amazing, one-of-a-kind light fixture. Generally, when I begin a project, I sit with the architectural plans a bit and really start combing through and dissecting each space. It’s during this assessment phase that I start to envision the “moments” of each room. It was clear from the start that in this summer home, there would be many memories made around the breakfast table. The informal dining area that bridges the kitchen and family room would be the site of early morning coffee and epic, late-night board game tournaments. This was a spot where we wanted to incorporate something special, something that drew people in, captured their attention, and spoke to a sense of place and history. Nantucket sits at the center of the whaling history of the United States, with the settlers starting near-shore whaling in 1676. The small island continued to thrive as a whaling center, with deep-ocean whaling developing in the early 1700s. Their dominance continued until the Revolution, when the British Navy sent most of the whaling ships to the bottom of Nantucket Sound. It took nearly forty years for the industry to recover from its losses, but the industry, with its danger, folklore, and history have made an indelible mark on the island. (You can learn more about the history of whaling, and Nantucket’s role in it, by visiting PBS’s fascinating timeline Into The Deep. ) For the island, as much as it is now a place for summer fun, cookouts and quality family time, the symbol of the harpoon still rings true. 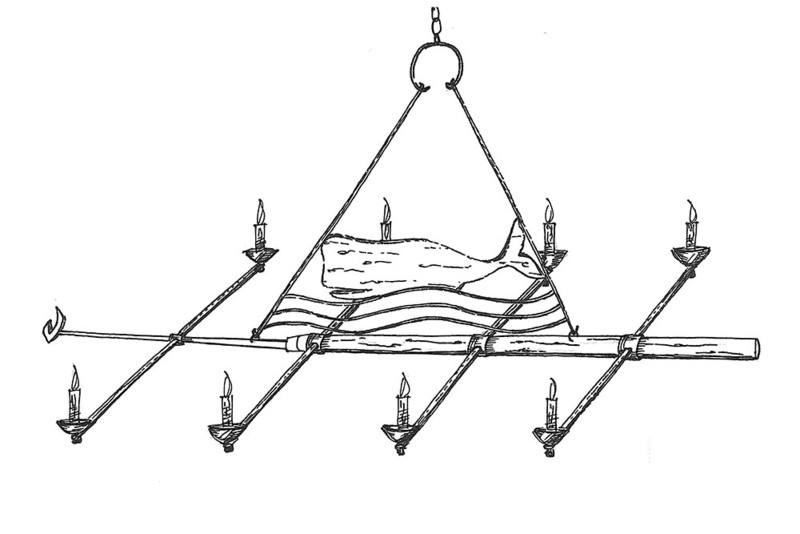 With a long, linear layout, the idea of using a harpoon as a light fixture was somewhat of an “aha” moment. So to the drawing board I went. Working with my team at SLC we began the process of bringing the idea to life. My team and I generally work in broad strokes and flush out the details of a custom piece through a series of rough sketches and a discussion of materials. With the basic elements in place, we then start the conversation about manufacturing. We decide logistically how the piece will be created, and for this fixture we decided to work with one of our favorite vendors, Paul Ferrante. Paul Ferrante is a family owned company that has been in business for over 50 years. 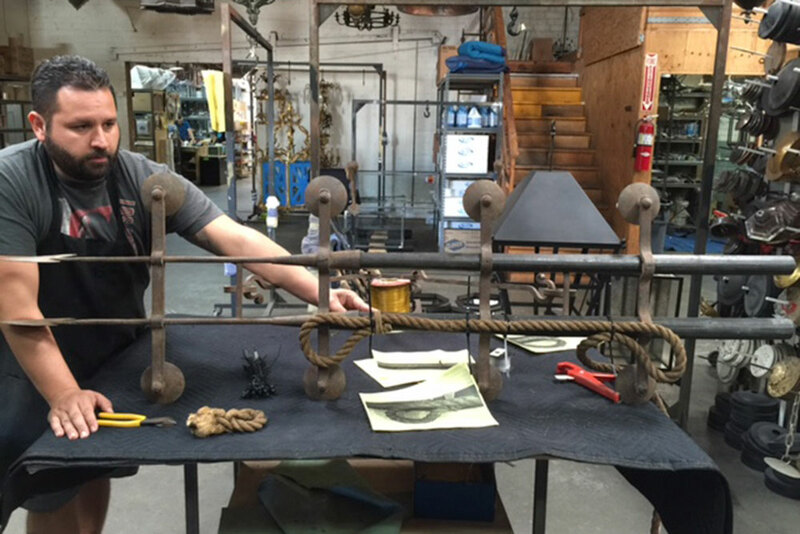 Based in Los Angeles, they create stunning, heirloom quality fixtures and furniture. I’ve collaborated with them numerous times before and knew their elevated level of style and craftsmanship would be a perfect match for our project. So here we are, we have an idea, a sketch, and someone to create it. Now for the materials. I knew we wanted this to feel authentic and though we could have had a replica harpoon made to our exact specifications, I decided to opt for the real deal. After a bit of searching we found exactly what we were looking for at Liza Sherman Antiques in NYC. The antique harpoons had a layered patina and authenticity that just felt right. The next step in the design process was laying the fixture out in the office. I mapped out the size of the table and thusly determined the exact size and scale of the chandelier. I find it’s always best to work with 1:1 scale whenever possible. After some consideration, I adapted my original design just a bit, as editing is an extremely important part of the design process. Next, we shipped the harpoons out to California. With the harpoons in Paul Ferrante’s capable hands my team kept in very close communications through the fabrication process, ensuring the final product was as close to the initial concept as possible. Seeing the final product is always a great reward, but witnessing the expression of joy on my clients’ faces is even better!